Corner any experienced diver into naming the destination they dream about and the answer will very likely be Raja Ampat. If they haven’t as yet been there, it is surely number one on their bucket list. And if they have indeed reveled in those lush aqua waters, they’re no doubt fantasizing about the day they can return. 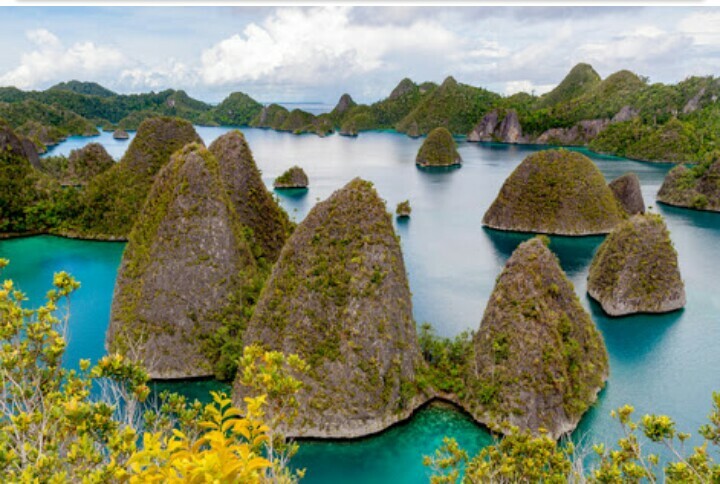 The Indonesian archipelago of Raja Ampat lies in the Coral Triangle. This expanse of 40,000 square kilometers of marine territory and pristine reefs make these waters a diving haven second to none. Reputed to be the most biodiverse marine habitat on Earth, Raja Ampat is home to many species not found anywhere else. Spectacular, other worldly, the stuff of under-water revelries, Raja Ampat is irresistible to divers. Having long been accessible primarily by liveaboard, accommodation has evolved over the last few years as Raja Ampat’s sojourning options increase. Divers of all levels may be grateful that a variety of resorts and homestays are springing up on these remote islands. Finally, deep-sea adventurers the world-over can enjoy a range of options on how they spend their holidays. While Raja Ampat was long a magnet for more experienced divers, the steady upsurge in offerings is attracting new devotees enchanted by the area’s holy grail of diving. Along with the growth of bed and board options, the array of visitors both on land and in the pristine waters is also on the increase. Long shut out of these beautiful waters, today’s guests might have beginner certifications with only a few dives under their belt. Some may be diving for the first time, while others may not be diving at all. But none of that is stopping visitors from making the well worth the effort journey to discover the wonders of this coveted region. It may be difficult to imagine the breadth of Raja Ampat with its more than 1,500 small islands, cays, and shoals. One of the region’s jewels is the smaller but still sizeable island of Gam, separated from Waigeo, one of the four main islands, by a narrow passage. Easily accessible, Gam is in the heart of the Dampier Straight, which rightfully claims some of the most famous dive sites in the world. Traversing Gam, fortunate beachcombers encounter a long, breathtaking strip of white sandy beach known locally as Pantai Yenanas. The beach is home to the Raja Ampat Biodiversity Resort, doubly favoured by both nature and hosts. Imagine rising in the early morning and heading to your deck to be greeted by dolphins playing amid the gorgeous shades of varying deep blue sea. And all before your morning coffee or suiting up. The Raja Ampat Biodiversity Eco Resort was dreamt up and designed by Rey Andaluz and Patricia Sanz. Originating from Spain, the ebullient, charming couple holidayed in Raja Ampat some five years ago in what turned out to be a life-changing trip. They became so enamoured they knew at once this was the place to make their vision come alive. Raja Ampat Biodiversity Resort grew out of the passion that drives Rey and Patricia. They continue to consciously and environmentally build and invest to provide a holiday destination that encourages guests to explore and experience the heavenly environs of Raja Ampat. While they acknowledge that the island of Gam was selected for its beauty, it was also chosen for its proximity to Waisai, making the resort a destination that is both accessible and affordable. Daily ferries bring guests from Sorong to Waisai and then a relaxing 30 minute boat ride brings you to this idyllic getaway. This schedule allows the guests the flexibility to arrange dates around their own plans. Every aspect of the resort is underpinned by a single question. Is this what the hosts would seek out for their holiday? Clearly, the answer is yes. The resort is designed to connect guests with nature in this celebrated dive destination. From the range of accommodations and excursions, to the finger licking, delicious food and safe diving, to the engaging, caring staff, every detail has been planned to insure not only an amazing holiday, but to also provide a real taste for this area and Indonesia. Entering the resort feels like entering a friend’s home. A huge outdoor communal area welcomes guests to gather, relax and swap stories about their day. Imagine a comfortable, relaxed living room/dining room where family style meals are served. Food is important on a holiday and with enticing dish after dish presented from the kitchen, the chef proves this to be true. And you most definitely won’t go hungry here. Meals are varied and delicious with emphasis on Indonesian cuisine with sprinkles of recipes adapted from Patricia’s Spanish roots. As much as possible of the high quality ingredients are locally sourced. Fishermen arrive by boat to sell their daily catch (no reef fish) and villagers bring homegrown fruits and vegetables. No carbon emissions guilt from this type of food delivery. Additional provisions originate in the markets of Waisai, where villagers come to sell their offerings. Kitchen products from chili sauce to cooking oils are bought in bulk and appear on the dining table in refillable containers, with empty bulk containers repurposed for kerosene storage for the stove. Conservation goes beyond the kitchen, however. Most guest rooms feature traditional Indonesian “mandi” bucket showers. “Dirty” oil from generators and compressors is used to paint and protect the wooden structures, while the compressors’ carbon and molecular run off is made into bricks. And the environmental efforts go on: a major investment to build a solar panel; construction that utilises traditional Papuan building materials purchased from nearby villages to harmonise with the local environment. The strong commitment to conservation that lies at the heart of this eco resort makes for a neighbour that purchases local timber, virgin coconut oil, weavings for the roof and woodcarvings. Then there is the staff: some 95% of the employees from neighboring villages and Sorong are new to the hospitality industry. Trained on site and treated like family, they play an important role in assuring that guests enjoy their visit. Naturally, pun intended, the most popular reason to visit Raja Ampat, while stunning above the surface, is for the magic that happens under water. Just minutes from the Dampier Straight, the area is home to nearly 600 species of coral, including 75 percent of all coral species known in the world, as well as at least 1,074 fish species. Imagine descending into the big blue, encountering a rainbow of colours in the vibrant, thriving reefs. These marine invertebrates live in colonies of polyps and create a kaleidoscope of unique formations that stun the eyes of the most seasoned divers and spoil forever the neophytes. Then the marine life comes alive, as if they know how special they are and want to share their secret. Schools of fusiliers and jacks duck and sway in the currents, bump head parrot fish chomp away on the corals, shy Denise’s pygmy seahorses hide among gorgonian coral and white/black tip reef sharks sweep and patrol effortlessly through the sea. All a short boat ride from the resort. Dive sites include Blue Magic, where majestic mantas, grey reef sharks, and schools of big-eyed trevally and barracudas put on a spectacular show. Sardine Reef, with a top of five meters, offers one of the best reef dives in the world to witness biodiversity in all its glory. Unforgettable, too, is Cape Kri that put Raja Ampat on the map when Dr. Gerry Allen smashed his record for the total number of fish species on a single tank dive – 374 species!